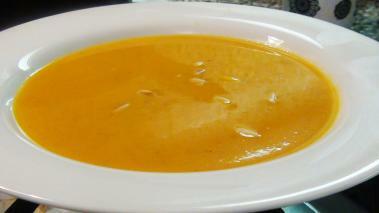 One of my favorite soups is Butternut Squash. The soup is sweet and savory, has a beautiful color and texture, and while it’s great all year long, it is the perfect soup for Fall. I make a very traditional butternut squash soup that is great, but in this recipe I change it up with the addition of Coconut and Curry. The coconut adds a nice tropical background flavor, and the curry powder an exotic quality and much more complex flavor profile. While you’ll certainly recognize the original, this version is definitely unique and definitely delicious. Hope you enjoy it! Sauté, but don’t brown, the onion, celery and carrot. Browned, the flavors become too strong, and can change the color of this beautiful soup. In a soup pot over medium heat, add olive oil to coat the pot, and add the onions, celery, carrot and garlic. You’re ready to go. I like to serve mine with a few traditional curry garnishes like peanuts, raisins, or toasted coconut. Hope you enjoy it!